Carl's Curios: Who, what. where, when? (1) Superb piece of carving. Possibly lime wood. Not English. Somewhere between France and Poland. Not as early as it looks - possibly 19th/20th century. Makes me feel uncomfortable! (2) Box made out of a cocoa nut. Late 19th century. Eastern. 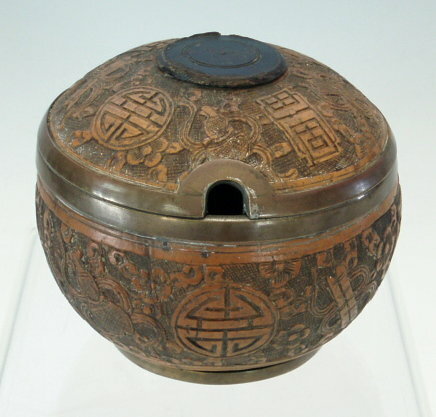 (3) Chinese thingee - made out of a cocoa nut. 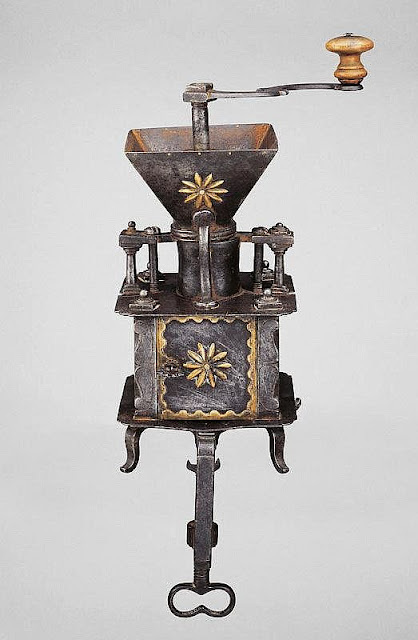 (4) 18th century coffee grinder - French. 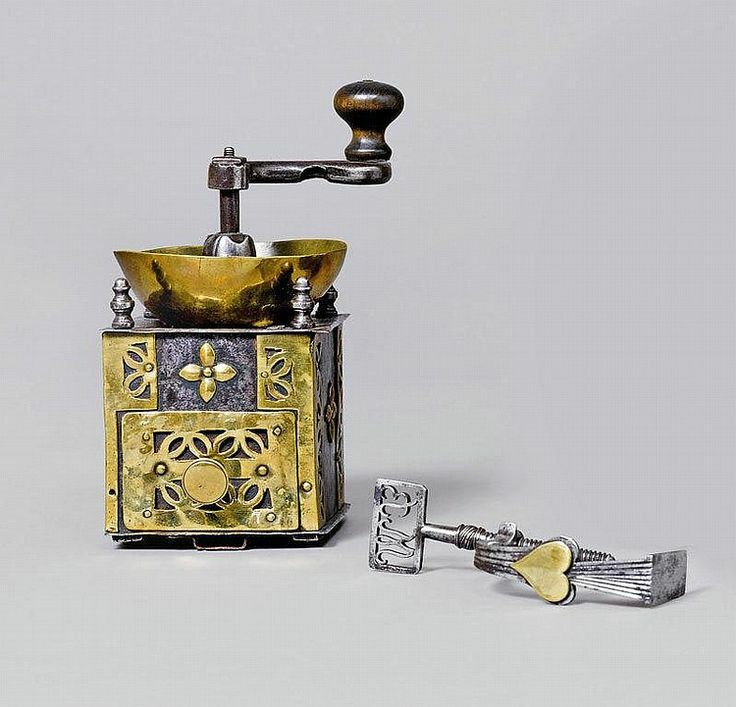 (5) 18th/19th century coffee grinder - German. 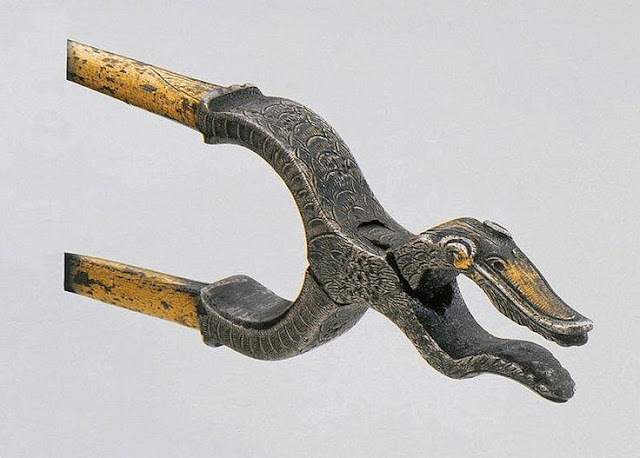 (6)Pair of 18th century tongs. Well made (note box joint). Eastern European - German?Poland. (7)Ahh! Do know what this is. It's a cork squisher for bottling wine. 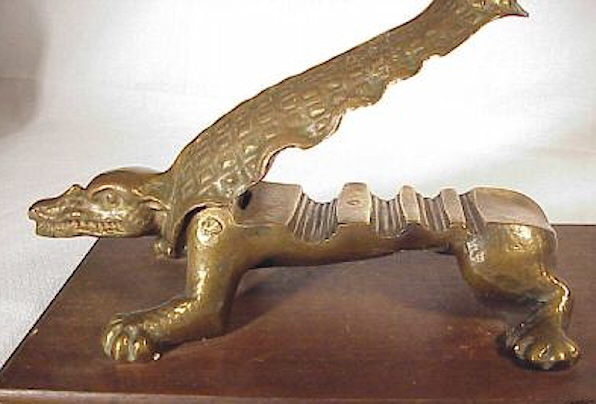 Rather offensive reptillian creature, brass, probably French, or German. Or elsewhere. 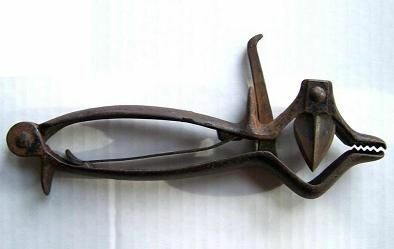 (8) Prehistoric (well Victorian) tin opener. 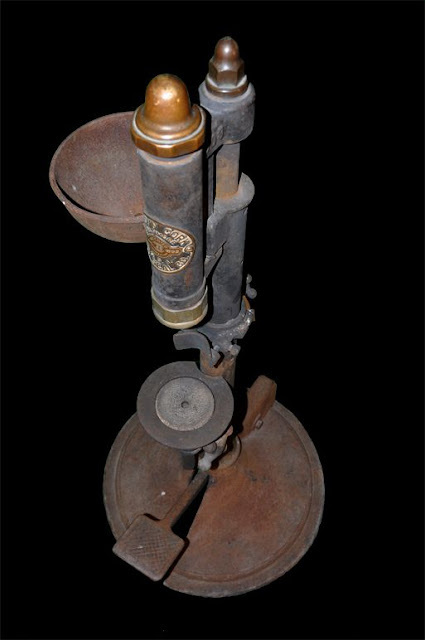 (9)Part of a cartridge reloading kit, circa 1870. European?early American. (10)Leather workers vice. European. 18th century. P.s. The object in photo number 4, to the right of the coffee grinder appears to be a primitive mainspring cramp, probably from the same workshop. re your PS, Mike, you may see that item 5 has a similar object attached and that Item 4 has a slot in the base. I don't think the fretted MB on the key of your 'Main-spring cramp' stands for Mr Baker of Baker rifle fame. I'll give you the clue 'Huguenot shipping magnate & Swedish Admiral' for no.1 and agree it is beautifully made but would be less creepy with painted eyes. 3. yes if thingee is Cantonese for opium jar. 4 & 5 Ok but what are the 'cramps' for, please? 6. OK what about the handles? 9. No but I can see what you mean. 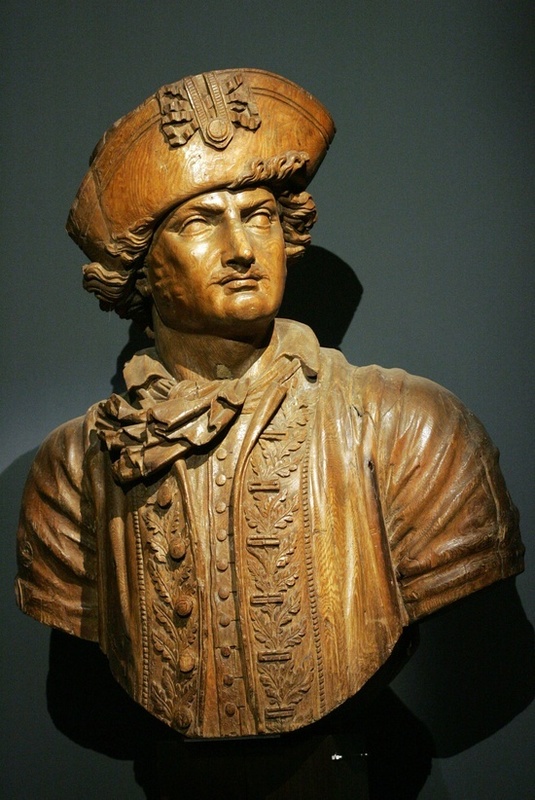 Number 1 is Abraham Duquesne, (marquis du Bouchet) who was a French naval officer but also saw service as an admiral in the Swedish navy. He was born in Dieppe, a seaport, in 1610, and was a Huguenot. P.s. The coffee grinders both have a device to clamp the grinders to a table top. but also everything else you've both said. 8 is a husker for what we used to call maize or Indian Corn 9 is a triple purpose bottle sealer for both corks, crown-caps and keeping snuff in. The handles on item 6. are very like screwdrivers and with the squarish jaws I wondered if this might be a gun multi-tool for barrel and side-plate removal, Mike? Possibly, I suppose. The jaw shape is one I've seen in blacksmith's shops, but on cruder tools than that . I've seen the blacksmith's ones in use in shaping red hot horseshoes. Once again - I don't know. 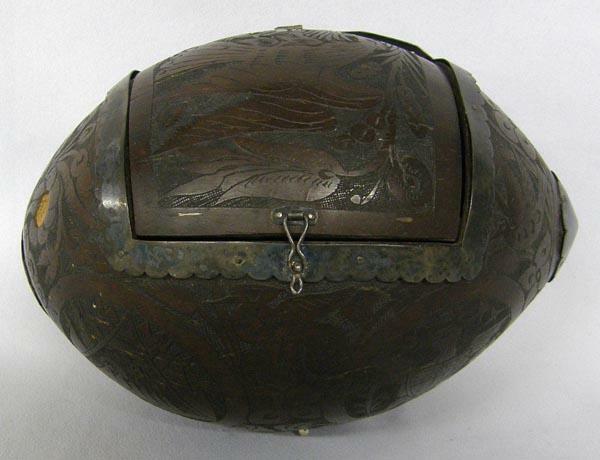 But, in this case, probably not a snuff box; although a pinch of snuff could be taken with it. That would be a pinch to sneeze at! I may be incommunicado for some time, Windows 10 has just installed on Pootatu and has screwed up all the saved passwords on my e-mails, but I still seem to be functioning on Larstpoota pro-tem.